In the end, Chicago overwhelms me. But not until the end. Not until I have to sit in this pub on Michigan Avenue with a raspberry beer that’s not very raspberry-ish, the bartender’s words, and a turkey sandwich and a bowl of chicken soup. Not until I stare up at a monitor watching a college basketball game with teams and players I don’t recognize. That’s when it settles. The sense of being stuck dead in the middle of America, sitting at the bar with all of its baggage. Jazz. The blues. The World Fair. Both of them. The fire. The White City. The serial killer. The coal dust. The skyscrapers. The Gehry amphitheater. Chandeliers hung with enormous garnets like bloody teardrops. The tallest skyscraper that has a new name now. The bean. 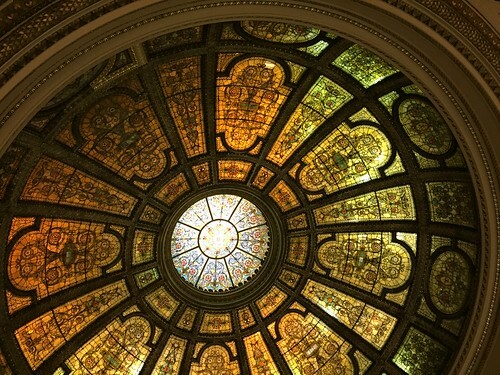 Tiffany glass and mosaics and chase lights. Theater marquis bigger than ones in New York. Italian restaurants lit up in neon. “Postmodernism” perched on the top of a building with giant green wings. Blue-period Picasso. Sunday in the Park hung on a wall with its two frames, the one Surat painted in dots and the actual wooden one, which is just white. And the little French gift shop while I buy an $8 bar of soap and a tin pillbox from the 1920s. Ice skating in the park with kids half my age, wobbling on my feet. Palmer House brownies under the sprawling Valentine ceiling and going into the vault to see the stacks of Limoges, all the sets complete, gold around the rims of the glasses, all of it commissioned for a party for General Grant. It knows me, Chicago. All the rooms a little overheated, everyone in sweaters and jeans. There are no heels, no one tottering in narrow skits. Just people laced up to their necks in down and bulky scarves and fur-trimmed hoods. Every menu has a version of chicken soup and hot chocolate. Every hotel has heat lamps. Every car has the vents fully open, blasting warm air. I want New York to be like this too, a little stuffy, the warmth pouring, the wagons circled. A cottony headache all the time. I walk everywhere that I can bear to walk. North of the ice-covered river past the rock and roll corn cobs. To the building called the Medinah that was built as a theater but is now a Bloomingdales, where the faux-Islamic onion-bulb roof remains intact, along with all the colored glass windows that you can see up close when you go into the second-floor ladies room. Past the weirdly posh Forever 21 and into the Aqua Tower where I sit in the lobby of the hotel by the modern fireplace, a long, long wall of gas-jet flame. Paper lantern fixtures. A wall of something that looks like exaggerated gold chain mail. And I sit in a pink chair shaped like a bubble and listen to a woman talk in a loud voice about a parents mutiny in her son’s boy scout troop. Then I crash, the moment at the bar. In my sweater. Sweating in my sweater. The second city feels bigger, noisier, more jammed than the first. As heavy as the layers of my coat, my scarf, my gloves, the shirt under my shirt under my sweater. Chicago deep-dished, scooped me out. I write in my journal the line, “This might not make any sense, but…” And then I stop. I can’t think of a way to finish the sentence. I drop my pen. The city has swallowed me whole. I try to stop my brain, from following the trails of history. The freed slaves. The native traders. The kids looking for a city in which to come of age. The gangsters that they don’t talk about on a lot of the tours. The socialites. The step before New York, or maybe the step after. I have seen almost nothing. A few blocks, the center of the center. Any more, on this trip, I couldn’t have borne. I would need a subway, a car, a plan. I would need, I would want, a second time.